31st: Halloween – Try not to scare us too much with your spookiest dish. Halloween was never a part of my childhood being in Australia, so I don't really get excited about it now. It is becoming a bit more popular here these days, and now you can get carving pumpkins and shops have small displays of decorations and costumes as well. We don't really have any trick or treating in our area, and to be honest we normally turn off the doorbell just in case. Not being mean, just not particularly interested and I don't want to buy a heap of expensive vegan candy to hand out on the off chance someone does stop by. Anyway, I don't mind a bit of Halloween themed fun every now and then. Though I 100% am against all the gross eye-related themed things of food and decorations. NO NO NO do not make me be sick because I will be and then it will all be really gross. Cute little chocolate chip or olive dots, yes. Anything more realistic than that, NO. See above re being sick. Anyway, I made a thing for this theme, and for the final day of MoFo! 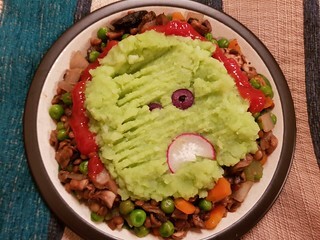 Monster Mash Shepherd's Pie: I am a fan of shepherd's pie, so this seemed like a good choice. The stew-component is lentil and mushroom based, and comes together pretty quickly. I only had three cups of lentils (using 2 tins) rather than 4, so I upped the mushroom a little. The potato topping is a ghoulish green, thanks to the addition of scallions and cilantro. I only used 1 cup of scallions rather than 2, because I'm not a fan of raw oniony flavour, but it still got nice and green. I also used some potato boiling water with a splash of olive oil instead of all the olive oil... 1/2 cup of olive oil is just too oily for me. I got about 5-6 servings out of this. There is no baking step, as you are making little monsters out of the mash, so it comes together pretty easily and fast. My poor little Monster Mash is really not that scary. I am not good at cutting teeth into radishes. BOO! 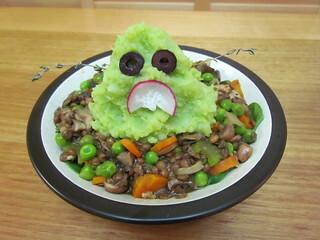 And then, dear readers, I mashed that monster. 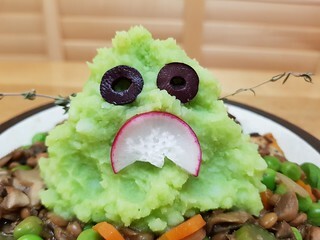 I mashed him and his brains squished out! No, not really. I gave him a ketchup halo because I always like ketchup with my shepherd's pie. Sorry little green one. And so ends another year of MoFo! It's definitely been a bit of a challenge this year, but I am so glad that I got through it! I am going to be a bit scarce over the next few weeks. My beautiful friend Molly is coming to visit me from Seattle, and we are going to have some time adventuring in both Brisbane and Melbourne, so keep an eye out for future posts detailing all our fun! If I have time I will write and schedule my OzComicCon Brisbane and Sydney posts to come out during that time, just to keep a little bit of content going! This ends my month of Sahara as well, but my love of Sahara will never end. 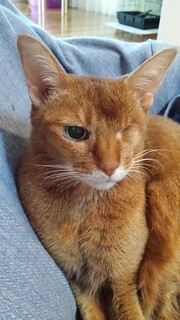 Even though she is no longer physically with me, she is always always always in my heart and on my mind. Every post I do on this blog has a kitty photos, and I will continue to share photos of her and her angel-sister Gizmo here, so you will be seeing their beautiful faces again. And of course, Dim Sim continues to provide never ending photo opportunities of a sleeping black cat for me to share here as well! It really isn't long until the holidays are here! And as an Australia, I mean until Christmas is here, as we don't have Thanksgiving. Two months to go, though the shops have been selling Christmas stuff for the last several weeks. 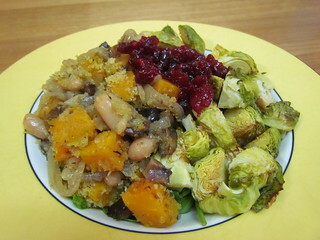 I decided to make a holiday-themed dinner from Veganomicon, the original one. I know there is a new edition that has just come out, but I am still old school and stuck in the past with my treasured old copy. Caramelised Onion-Butternut Roast with Chestnuts: The idea of roasting and peeling chestnuts from scratch does not appeal to me, I don't think the end result is worth the effort, but I had found some packaged chestnuts for cheap in an Asian store ages ago and I needed to use them up, so this seemed like a good chance. The recipe calls for a pound of chestnuts in the shell, I had 250g of ready to use chestnuts, which was enough for me. I always find chestnuts oddly textured. 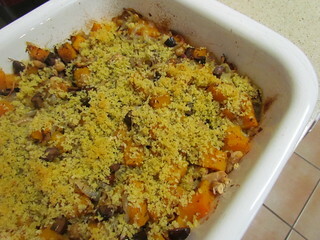 For this casserole, onions are roasted in a pan (mine never did go brown and crispy, but they still tasted good) and then are mixed with butternut, chestnut, white beans and herbs and baked. At the end, a herby breadcrumb mix is put on top and baked until golden. This is a fairly easy casserole if you don't have to fiddle with the chestnuts, most of the time involved is baking time. And it ends up with a nice sweet flavour, with a bit of salt from the topping. The recipe says it serves 6-8, but I would say it serves 4. Holiday Cranberry Sauce: This recipe calls for apple cider, and in Australia our apple cider is alcoholic and fizzy and not at all what this recipe wants. I always think of cider as being spiced, but I did some reading and it seems like a lot of cider is just unprocessed apple juice? So I used some fresh pressed cloudy apple juice from a bottle for it. The recipe claims to make 5 cups, and I didn't want that much, so I scaled it down to 1/3 of the recipe but ended up with less than a cup. 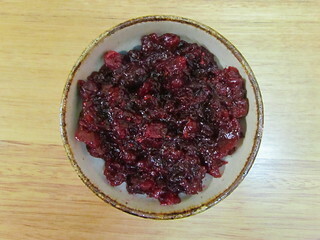 I used the agar powder option, and I used frozen cranberries. I found this to be a very tart sauce, on its own I was not a huge fan. It did go well with the sweetness of the casserole, but I don't think I'd make to to plonk on top of a roast dinner. And here it is all together! I served it over some wilted baby spinach and brown rice, and with some roasted Brussels sprouts. 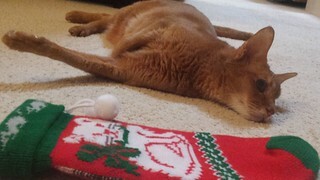 Sahara and our kitty Christmas stocking. This was last year, which was her last Christmas. 29th: History – What would you cook for your favourite historical figure? I struggled with this prompt. Initially I thought Elizabeth I, because I am quite interested in her, though I don't know if 'favourite' is the right word because she did some fairly horribly things. And I guess that is the problem with a lot of historical figures. You can be fascinated by them, but often they have some pretty significant baggage. Then I thought maybe I would make a 17th century French-inspired menu, because my current favourite history-based TV show is Versailles. How do those men keep those long locks so smooth and shiny? It is a mystery! But the way things worked out I didn't have much time. So I decided to pick Jane Austen, who is well known and is responsible for my very favourite book, Pride & Prejudice. 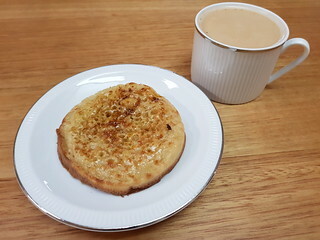 To start my planning, I had a suitable breakfast of a crumpet with Nuttelex and golden syrup and a cup of chocolate chai. From my reading, it seems that while afternoon tea was becoming common in the Regency era that Jane lived in, the more lavish and fancy affairs that we think of as high tea was really perfected in the later Victorian era. This is a gross oversimplification, but there is some interesting food history on afternoon tea and high tea on the internet if you care to search. However, if you were to visit the Jane Austen tea rooms in Bath, the menu certainly does have a nice fancy high tea theme. So we'll go with that. First up, what to serve? A selection of savouries and sweets. 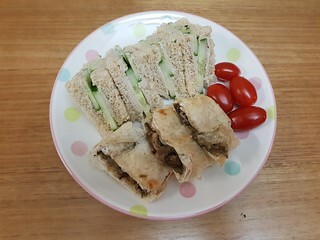 I went with the classic cucumber and cream cheese combination for my little sandwiches. I used a local cashew cream cheese from Primal Foods, which I am sad to say I won't be buying again because I am not a huge fan of the flavour, but it was OK when added to the sandwich. A hot pastry is also often served, and I had this handy roll kicking about in my freezer that I zapped in the microwave and diced into dainty pieces. It was not bad! 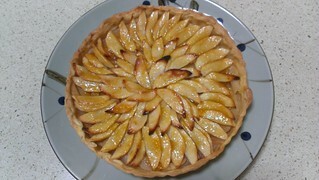 For sweets, I made two recipes. 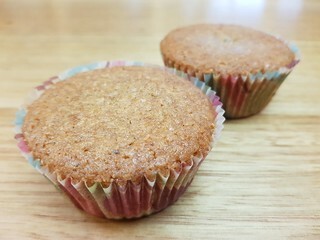 First up, the Apple Sauce Coconut Cupcakes from Wing It Vegan. I made a couple of changes, that I hope River will allow. First of all, River is adamantly against cinnamon in these, I love cinnamon! But I was willing to forgo it. Except then I remembered that I had some leftover chai-spiced sugar sitting around that I needed to use up, that has cinnamon, cardamom, and cloves in it, so I used that as the sugar. I also left out the almond extract (I find it overpowering) and added some coconut extract instead. It was definitely a spiced apple coconut cupcake, but I really liked the flavour! I do have a toaster oven, but it sounds nothing like River's, so I baked these in my regular oven. I did 20 minutes at 180dC, but they were still a bit blonde on top and soft in the middle, so I put them back in for 10 minutes and turned it up to 200dC and it was perfect. Scones with Jam and Cream from Taste of Life by Animals Australia: Of course scones have to make an appearance, though there is some debate as to whether these were commonly served in the Regency era, they were definitely seen in the Victorian era. Proper UK/Australian scones are not the same beast as what the US considers a scones... they more closely resemble US biscuits, I think. 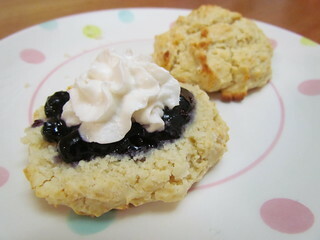 These scones are super easy to make, with only three ingredients! I made a quarter batch and got two large scones. The batter was quite sticky, and I just patted it into shape rather than cutting it, so you can see my scones are a bit flat. But they tasted good! 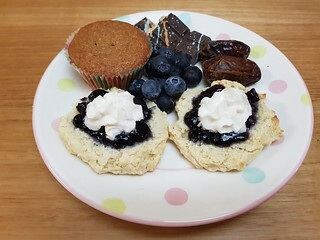 I skipped making the vanilla coconut cream and used some Soyatoo Rice Whip, and I also served them with some St Dalfour's Blueberry Jam. In added some additional things to my plates. Some grape tomatoes for the savoury plate for freshness. And for the sweet plate I added some dates, blueberries, and some Treat Dreams Speculaas Dark Chocolate squares. I hope Jane would be happy! And of course, some tea! With the exception of an occasional cup of black-tea based chai (see above) and the odd matcha, I generally avoid caffeine-based hot drinks. So I brewed up a pot of one of my favourite caffeine-free teas, the Vanilla Rooibos from T2. 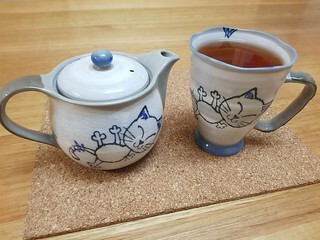 Served in my cute little kitty pot and mug set! 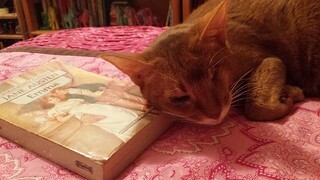 Last year I re-read all of Jane Austen's books. Sahara thought that Emma made a good pillow. 28th: Brunch: the under appreciated get-together meal. Is brunch really under appreciated? I get pretty excited by the thought of brunch, though often my idea of a 'brunch' time is more like a breakfast time... I generally get up early! Earlier this year, one of our most beloved vets left us to move to Perth, so we had a little clinic brunch to say goodbye. Chapter IV in Paddington was chosen, as it had a good range of food to suit all fancies. 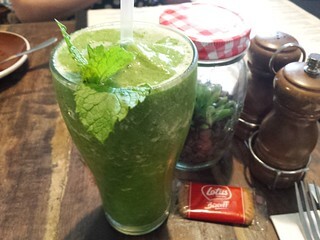 I couldn't resist ordering the Mighty Green Smoothie, which had spinach, kale, banana, coconut water, lychees and mint. It was so refreshing! This was back at the start of the year, so it was a hot and sweaty day. You will also notice a little Lotus Biscoff cookie - they gave them out when people ordered a coffee. But not everyone wanted theirs, so I was happy to snaffle them up. I ordered their vegan stack. Unfortunately I didn't write down what was in this, and they seem to have changed their menu (the current stack is no longer vegan). 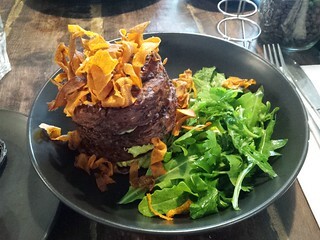 But I am pretty sure it was a stack of rosti with avocado, a green salad and some sweet potato crisps. I also got a side of mushrooms. It was a nice brunch. This was quite a lovely cafe. We were able to reserve a table inside because it was such a stinker of a day, but they also have a verandah out the back that you can sit on with some beautiful views if that is your fancy. They have a couple of nice sounding vegan things on their current menu, also a few that sound like they should be vegan or able to be made vegan... definitely double check on that! But a very pleasant brunch experience if you are looking for a place that caters to everyone. Just a couple of silly cinnamons. In related news, I am terrible at taking selfies. I've been pretty pressed for time this MoFo, but I am glad I got the chance to make at least one menu. This is the Child's Birthday Menu from Celebrate Vegan by Dynise Balcavage, and it is also the first time that I've used this book. Oh, bonus recipe for you at the end because I modified something so much that I actually made something new!! 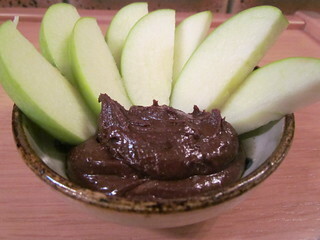 Chocolate Peanut Butter Dip: I actually made this separately from the rest and had it for breakfast with some apple slices, which was lovely. I just made a mini-batch for one, using 1/4C peanut butter instead of 2C and scaling down the cocoa and agave as appropriate. I used normal cocoa rather than Dutch cocoa, because Dutch cocoa is expensive here. 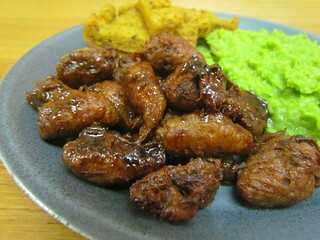 Orange-Soy Seitan Tenders: These are very good, and the sauce gets a very strong flavour. Instead of seitan chunks, I used some Lamyong Soy Nuggets that I had kicking around in the freezer, I defrosted them for this. The seitan/nuggets are marinated overnight before a long bake. I was a bit short on orange juice for the marinade, my oranges were weirdly dry when I cut them for juicing, but it was still good. I was worried that the Lamyong nuggets might end up getting tough or weird with the defrost and baking, but they were tender on the inside and a bit crispy on the outside - perfect! My mum particularly loved these. Should note I scaled the recipe down for three people, so I used three cups of nuggets instead of four and altered the sauce appropriately. Three adult people, I should specify. The book says the recipe makes 8-10 servings for kids. 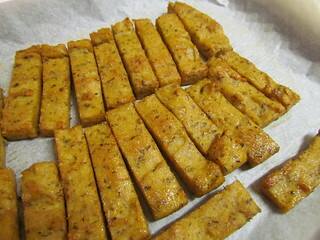 Baked Polenta Fries: I made a half recipe of these, which was enough for three people with the rest of the menu, but they are good so you might want to make more. Cheesy, herb polenta is set overnight, cut into strips, and baked. It is super quick and easy. 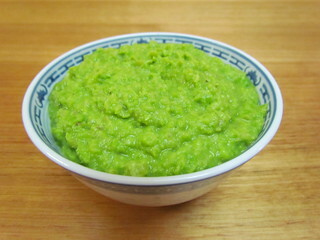 Mushy Peas: The surprise favourite for me! I loved how sweet and creamy they were, a perfect counterpoint to the strong sauce on the nuggets and the saltiness of the fries. 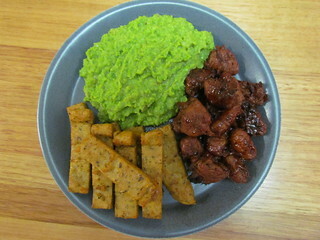 The full recipe, using 4 cups of peas, apparently makes 8 servings for kids. I had three adults, so made it with three cups of peas. We each got a nice big mound. I also just blitzed this in the pot with my immersion blender rather than putting it into a blender or processor. Faster clean up. And here is the plate with everything on it. I also added some ketchup right before eating for the polenta fries. Because I had set the polenta to set and the nuggets to marinate the day before, this came together incredibly quickly the next night. So I think it would be quite an easy menu to prepare for an actual party! I Made A Thing: Not A Shirley Temple: Recipe time! The book also includes a recipe to make a big punch bowl of Shirley Temples, using maraschino cherries and their juice and some lemon-lime soda. This does not appeal to me at all, so I took inspiration from the basic flavours and made my own! 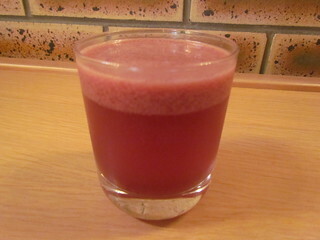 Add 25 mL St Dalfours Black Cherry Jam, 1 cup coconut water, 1/2 tsp lemon juice and 1/2 tsp lime juice and blend together. Serve over ice if desired. Makes 1 serve. So good! It is a bit sweet, a bit tart, and very refreshing! I was feeling super lazy and just blitzed it with my immersion blender, so you can see how it separated out a bit. But if you wanted to go super fancy, blend it properly and then strain it to take out any little bits of cherry skin still in it, then it would look clear and pink and lovely! Unlike mine. Sahara and Gizmo actually really loved each other. They got on well. 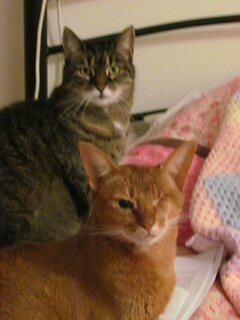 When we lived in Sydney, they used to spend a lot of time snuggled together, and grooming each other. Mostly Gizmo grooming Sahara, actually a dominance move on Gizmo's part, but a friendly one. When I moved back to Brisbane, to a much much bigger house, they had more options so they spread out a bit, but they always were friends. It was nice. VeganMoFo 2017 #26: Showstopping Sweeties. 26th: Showstopper Dessert – Something that would earn a handshake from Paul Hollywood! 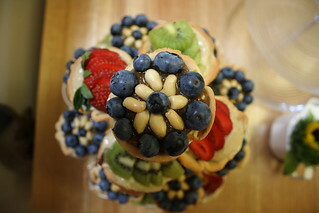 I've made a few impressive desserts in my time, and I've eaten a lot of them as well! Like this beautiful Two Spiced Apple Cake I made for the Christmas Menu of Party Vegan a while back. 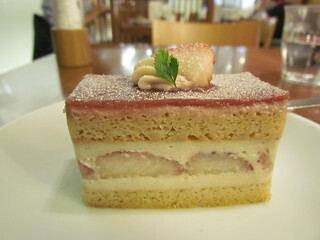 Or this best ever Strawberry Short Cake that I had three times from Chaya when I was in Japan. I still dream of this cake!! I decided to make something decadent for MoFo! 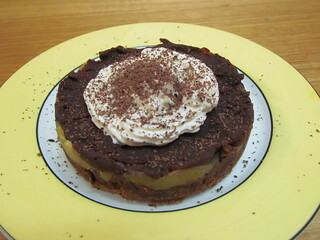 Chocolate Chestnut Pie from Keep It Vegan by Aine Carlin: I made a few changes to this recipe. First up, instead of making one big pie, I halved the recipe and used three mini cake tins (two were 10cm, one was 12cm). The chestnut in this recipe comes from both sweetened chestnut puree and sweetened chestnut spread. Chestnut products are extremely expensive in Australia, so I used a 500g packet of chestnut paste that I found in an Asian grocery store for only $4.50. Now, this isn't the same as what the recipe calls for. It also had some white bean powder in it and was quite thick, as it is meant to go into the middle of mochi. It is also not as sweet, which for me is a plus. Instead of melting the chocolate and adding it to the other ingredients (including the chestnut paste), I melted it and then mixed the other ingredients into the double boiler, because the heat helped the chestnut paste loosen up. 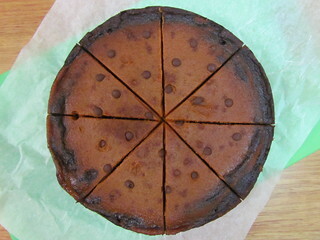 This pie has a layer of chocolate digestive biscuit base, a layer of chocolate chestnut, a layer of chestnut spread, and another layer of chocolate chestnut. Because the paste I was using was much thicker than the spread would have been, I used a bit more of it so that I could get a good middle layer. This recipe says to set up overnight, but the way I made it it was ready within a few hours. However, it tastes even better if left overnight! This is a pretty amazing dessert. I didn't make the sweetened coconut cream, but I did top it with some Soyatoo rice whip from a can and some grated chocolate. Another toy photo. I brought this Panda With Cookie home with me from VVC in 2015, and both Sahara and Dim Sim loved it. 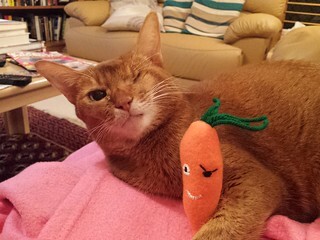 It particularly tickled me seeing Sahara with it, given that they are both one-eyed carrots. 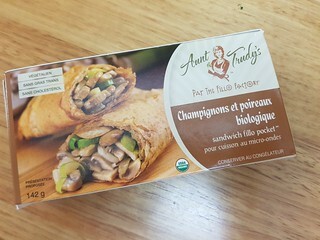 25th: Cook for your best friend – Tell us about your best friend and their favourite dish, make them a vegan version of it. Ashleigh is my beloved friend and life wife, so she was the natural choice for this post. We have had a lot of adventures, including traveling to Melbourne and the US together. And a lot of fun times at home as well! Every year for her birthday, I give her a new season of Lost Girl and we watch it over several weekends, and I make food. Sometimes it is a set menu from a cook book, other times I pick and choose. If it is her birthday specific lunch, it always includes cake as the dessert! Lasagna is her favourite food, so I was super excited about making the Handcrafted Lasagne from Veganize It, making the sauce, ricotta, parmesan, melty cheese and even pasta from scratch for her. However, life got in the way. She had to have all four of her wisdom teeth out just over a week ago, and while we were initially optimistic, her recovery did not care for our food plans. Of course I could not make the lasagna without her being able to eat it, so our plans have been postponed. Instead, here is are a few things that I have made for her at other times. She had to be gluten free for awhile, so I used cooking for her as a good chance to try out some recipes from Great Gluten Free Vegan Eats for her. The first dish, the pasta, I made one night before Ashleigh drove me down to the Gold Coast very early to get my veins zapped. She has been my support person twice for me during my long saga of vein zapping! The others are what I made for her birthday lunch in 2016. Enjoy! Stroganoff: This is creamy and mushroomy and good. 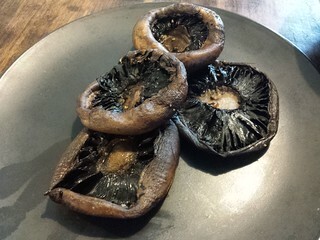 There is an error in the book, which calls for 20 oz or 174 g of sliced mushrooms, which obviously doesn't match up! 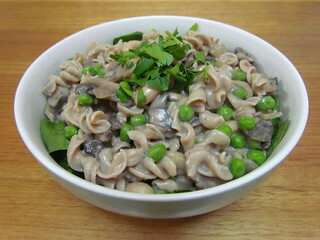 I used 400g of sliced mushrooms, which is a little less than required, and I used 250 g of pasta rather than 240g, but I also added cannelini beans and peas. The recipe calls for 420 mL of full fat coconut milk, but I used a 270 mL can of light coconut milk and made the rest up with water, it was fine. I also did not add the oil to toss through the cooked pasta, as that seemed unnecessary to me and I don't like things that are very oily. This recipe says it serves 6, we got four serves out of it served over spinach. 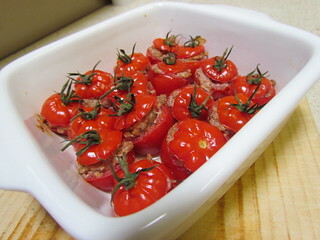 Stuffed Cherry Tomatoes: Nothing says 'you are special to me' like scooping and stuffing some tiny food. Actually, it came together pretty easily and wasn't quite as fiddly as I had feared. I made a half batch of filling, and filled 16 gem tomatoes. The gem tomatoes are a little bigger than cherry tomatoes, which made for easier scooping and stuffing. The filling uses walnuts, which was a little bitter on its own, but then matched with the sweetness of roasted tomatoes and balanced out lovely. I couldn't find any fresh sage, so I had to use dry and it was fine, and I also used garlic powder instead of fresh garlic. I didn't drizzle them with olive oil either, they were great as is. 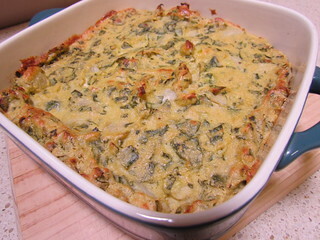 Spinach Artichoke Dip: I baked this up and served with some corn chips, GF crackers, and veggie sticks. It uses a blend of cashew cream and vegan mayo (I always use Vegenaise) as well as a hefty whack of nutritional yeast. I sometimes find this sort of dip can be a bit too rich and creamy, but this one was a great blend of creamy and tangy. It says it serves 8, but if you are munching away like us, you can easily get through this. 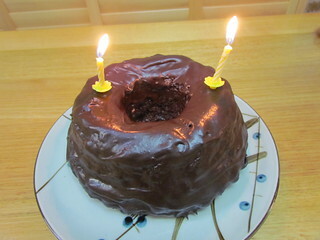 Dark Chocolate Chipotle Cake: Another year, another birthday cake. This cake gave me some troubles. It needed an extra 10 minutes to bake, and kind of stuck a bit in my silicone bundt pan. 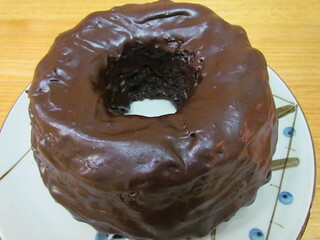 Thankfully you can't tell once it is covered in chocolate glaze! The glaze ended up being more like an icing, it was quite thick. It sets up quite nicely, though is still soft to touch. I don't mind a tiny bit of chili heat mixed with chocolate... but only mild! So I decreased the chipotle powder from 1 1/2 tsp to 1/2 tsp... and then I couldn't taste it at all once it was cooked! The cake had a moist, nice texture. However it uses quite a lot of apple cider vinegar and I found that taste a bit strong in the final product, though no one else seemed to mind! 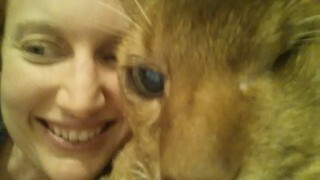 Sahara was always interested when any visitors came over, and she liked Ashleigh a lot. She would often join in our Lost Girl and Doctor Who days. 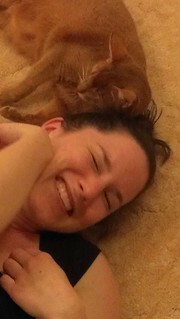 Here she is giving Ashleigh a head rub... with her own head! 24th: Party! – Canapés, finger foods, something to share. I don't go to a lot of parties, I am not one for large groups. But I do like to bake things to share. And I like to bake things for bake sales. And really, what is a bake sale if not a large sharing party that people pay for? While I am taking a break from organising bake sales, I have still been doing a bit of baking here and there from other bake sales. Fun bars and slices are always well received! Vegan Cookies Invade Your Cookie Jar is a great place to start if you are looking for something fun to make and to share. 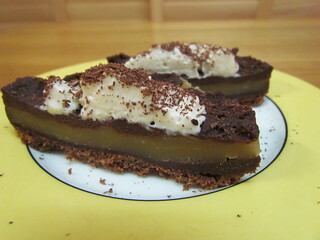 As well as a zillion cookie recipes, they also have some awesome slices. Here are four I have made recently. 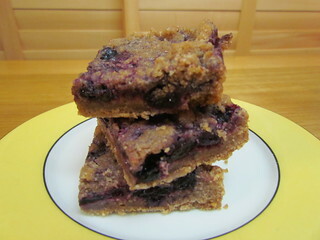 Blueberry Spice Crumb Bars: These are a lovely not too sweet snack, with spelt flour in the base and crumble. I used frozen blueberries for the filling, and added an extra teaspoon of cornstarch to make sure it thickened up enough. I just made a half batch of these bars, which fit perfectly into my 8 inch/20 cm square pan. 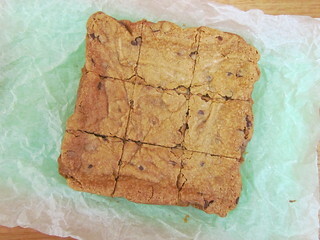 Call Me Blondies: I needed to bake these for an extra 15 minutes, and they ended up perfect. They rise high in the oven, but then flatted down when they cool. What this leaves is amazing crunchy edges and a wonderfully gooey inside. 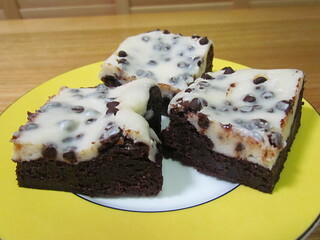 Chocolate Chip Cream Cheese Brownies: These are a combination of the Deluxe Cocoa Brownies for the base and then a yummy cream cheese topping, which is all baked together. I had to cook this an extra 10 minutes for it to set. These are wondefully fudgy and gooey, and have a great cheese cake flavour. They get sticky fast, so good to keep these in the fridge until they are ready to go. Pumpkin Pie Brownies: These gave me a bit of trouble, but it all worked out OK. I had used frozen and defrosted pumpkin puree, which had separated out a bit. When I added it to the rest of the pumpkin layer ingredients, it got a bit lumpy. I should have given it a quick blitz with the hand blender to emulsify, but I foolishly did not. The other thing was that there seemed to be a lot of liquid in the pumpkin layer regardless, I googled to see if this was an error but I couldn't find anything. It meant that I couldn't keep the pumpkin pie layer within the borders of the brownie layer, so it didn't look quite as cute as the book. I also had to bake this twice as long, for almost an hour, before it set enough. I was worried that the brownie layer would dry out, but thankfully it did not, and it turned out wonderfully. Pumpkin pie is not something we usually get here in Australia, so this was a fun treat! 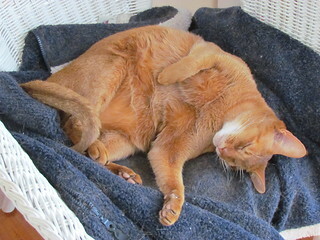 Speaking of pumpkins, Sahara had the best little Pumpkin Belleh around. I loved how she had the paler apricot fur mixed in with the cinnamon fur on her tum tum. And she let me rub it as well! VeganMoFo 2017 #23: Put it in a Martini Glass. VeganMoFo 2017 #12: Brisbane vegan shopping. VeganMoFo 2017 #6: Say cheese! VeganMoFo 2017 #4: That's not how you cook tofu.